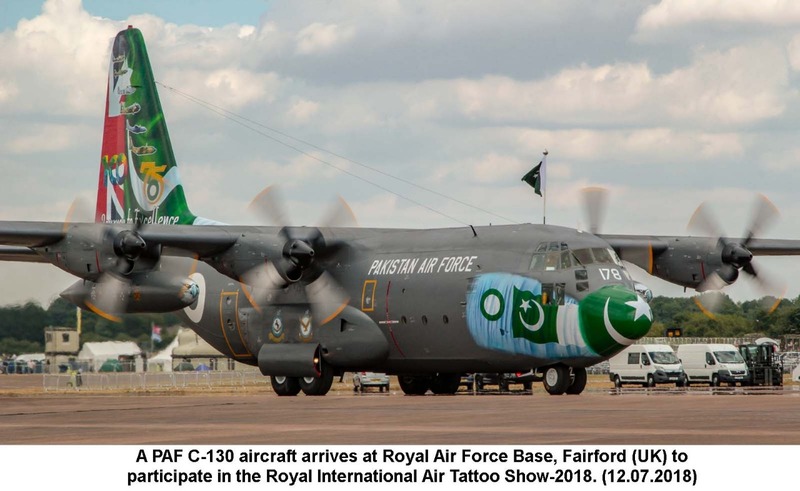 ISLAMABAD: An artistically painted PAF C-130 aircraft, landed at Royal Air Force Base, Fairford (UK) to participate in the Royal International Air Tattoo Show-2018. The No 6 squadron Hercules would be vying for the coveted Concours D’ Elegance trophy at the prestigious air show which will be opening for the general public from 13 July till 15 July. Theme of this year’s Airshow is the “International Centenary celebrations of the Royal Air Force”. The PAF contingent comprising air and ground crew will be participating in the various competitions and events organized at this mega event. PAF C-130 had also won the prestigious trophy in 2016, when it was adjudged the best aircraft for highlighting Pakistan’s role and its sacrifices in the war against terror. Reputed to be one of the biggest military air show in the world, Royal International Air Tattoo Show features modern military and classic aircraft from the reputed air forces of the world. Various Air Forces, aircraft operators, aerospace and technology companies as well as organizations are also participating in this mega show.